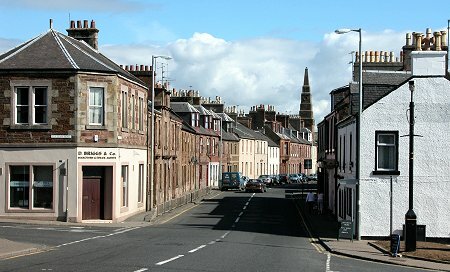 Maybole is the ancient capital of Carrick. As Miniboll it has a recorded history going back to the 1100s. Today it lies astride the A77 en route south from Ayr to Stranraer and is home amongst other things to an active campaign for a bypass to ease the impact of through traffic on the narrow High Street. Today's visitor finds a town whose lengthy history is evident from the many fine buildings on view. Maybole High Street is especially striking, running from the imposing Town Hall built in 1887 to the equally impressive and much more unexpected Maybole Castle dominating a street corner in the town. 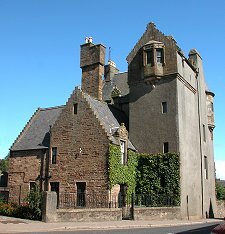 Maybole Castle is believed to be Maybole's oldest inhabited house, dating back to around 1560. It served as the town house and winter residence of the Earls of Cassillis and was originally built across the bottom of the High Street, whose route has since slightly shifted. In many ways the castle typifies the growth of Maybole. In 1686 it was recorded that the town was home to the town houses of no fewer that 28 lords and landowners with estates in Carrick and beyond. Today a brass plate on the gateway to the castle garden shows it to be the headquarters of May-Tag Ltd, a company founded in 1986 by the Community Council to provide training and tackle local unemployment. 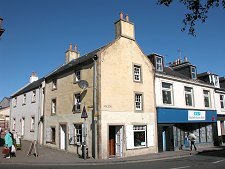 The third of Maybole's collection of truly remarkable buildings is found along Cassillis Street a little north east from the town centre. This is dominated by the Parish Church built in 1808 of a striking orange stone. But what really sets the church apart is its very odd square spire comprising six steps and looking as if it would feel entirely at home as part of an Aztec temple. 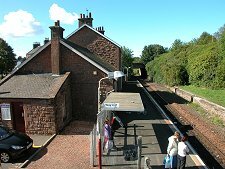 The Ayr and Maybole railway arrived in the town in 1856, and today it still provides an important service. As elsewhere, the railway brought change to Maybole, though its impact here was less positive than in many places. In Maybole the main effect was to confirm a growing trend that saw most of the Carrick lairds and landowners move their town houses to the larger stage of Ayr, leaving Maybole to take on a more industrial feel. 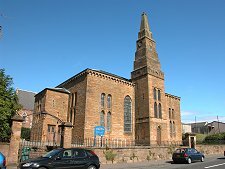 Another strand of Maybole's history can be traced through its strong links with the church. Two miles to the south are the remains of Crossraguel Abbey, founded in the 1200s and later a base from which much of Ayrshire was governed on behalf of the King. 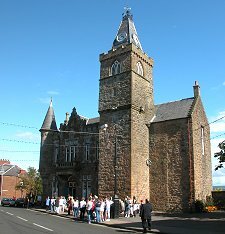 Maybole itself became home to a Collegiate Church, founded in 1371. One aspect of modern life in Maybole that really does help set it apart is completely invisible to the visitor approaching on the A77. Many places in Scotland now have community Internet sites designed to serve the needs of the community and promote it to the world at large. Many are good, and some are very good. 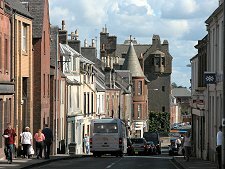 Amongst the very best is www.maybole.org This couples exceptionally simple design with effective navigation and a huge depth and variety of content about Maybole and about many of the surrounding villages. It is well worth a visit.